We are investigating the molecular mechanisms that underlie cell death, and are exploring the potential medical benefits that might arise from inhibition of death in certain disease states. 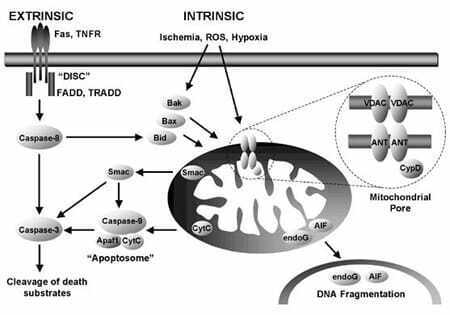 For example, inhibition of cell death in the heart could potentially rescue an individual from death or serious disease following myocardial infarction injury. In skeletal muscle, progressive loss of myofibers associated with muscular dystrophy is also regulated by specific molecular pathways that mediate apoptotic and / or necrotic cell death. Thus, inhibition of nodal cell death pathways could have a significant implication in combating diseases of striated muscle. We are currently focusing most of our efforts on elucidating the mitochondrial (intrinsic) cell death pathway, with a specific emphasis on the process of mitochondrial permeability pore formation. Our research has shown that permeability transition, as regulated by cyclophilin D in the inner mitochondrial matrix, serves a nodal function in controlling cell death in response to oxidative injury and calcium overload. We are extending these and other key observations in an attempt to better characterize the molecular underpinnings of cell death in mammalian tissues.